Before starting, you have to find 3 torn letter pieces. The 3 are found: next to Stapler the robot / laying next to the plants to the left of the screen over the big door / on the left corner in the path to the What's New screen. After finding the 3 pieces, you must use the Online Gateway on the 2nd floor and access the AlphaAFK website. Just solve the simple puzzle (doesn't matter if you get anything wrong, you'll ultimately land on the right answer) and you'll get the code 17PARIS. Go back downstairs to the HoloPAD and input the code and you've unlocked the first fragment piece. Once you've unlocked the first fragment, you'll be told about Stapler the broken robot. Go and talk to Stapler. It'll start spamming a bunch of nonsense and eventually give you the Getting to know me mission (if you'd wanna call it that. lol). He tells you to go over to the What's New screen and clap in front of it. Go over and do it. It'll ask you "What's Jess' favorite band?" and under it "(Miguel might know!)" I never figured out how to find the answer, as someone ran by and spammed it. lol In any case, the answer is AUTOMATIC, so inputting the code will unlock your first butterfly. As far as I know, these are the only missions available at the moment, with new ones on the way. I'll try keeping this updated as much as possible, so anyone who finds out anything new and wishes to share it, feel free to do so. - Talk to Stapler and select "A foreign language"
- There is a lengthy code here, and to find out what it meant I just Googled it. Each set of five characters (for example, V) represents a letter in the alphabet. Type a set of five into Google and it changes the code into the respective letter. - Input that code (VANESSAATALANTA) into the HoloPAD and you'll unlock the second butterfly. Rejected: Simple enough, just catch the cows by going under them as they fall, no problem. Sushatsu: A "massage" game where you slap people's backs. I found alternating by tapping the two buttons using both index fingers the fastest, although some people say it's fast by just hitting both buttons continuously at the same time. The most time consuming game of the bunch. Point Of Sale: If anyone ever played the game Yoshinoya on the PS2, you'll be familiar with this game. Just go to the left and hit the corresponding button of the game genre each customer wants, try to hand off to the first customer who asks before they leave or in the case of 3 asking almost at the same time, start with the closest one. Zombie Mall: Collect bags while avoiding zombies. This one can be a little time consuming, as it sometimes places bags in unavoidable spots(if you're trying to rush). Just keep a constant movement and try not to let the zombies bunch up along the edges. Pollen: Easiest/fastest game to beat, just move the bee onto the red flower, slowing down when you reach the center. Wash, rinse, repeat. Angry Mountain: Run back and forth collecting babies while avoiding lava rocks. It can be a tad difficult seeing where the rocks will land but just keep your eyes on the volcano to get an idea of where they'll be landing. You just have to alternate going left and right. After finishing the 6 games, run back towards the entrance and go through the right hall, where the Hexopolis Game Data screen is to finish and receive the fragment. At the time of writing this, this area is NOT accessible to the general public but can be accessed via other means. From the Game Test area, go through the right door to enter the Maximum-Tilt room. Your goal here is to ride a hoverbike in a virtual setting, while earning points as you go along without crashing into trees. 25000 points is required for the fragment. The best method to go about this is to follow the helicopter and trying to keep it centered above you at all times, just dodging trees in the process. I find tilting the control vertically (where your left would be over your right hand with the controller in between and vice versa) gets the best results in terms of control. People who've played Flower will have no problems here. Just score 25k for this piece. The end. You'll be rewarded with the 5th fragment piece. I completely disregarded areas and items that are NOT essential towards completion. 4. A schematic (possibly a road map) of colored lines with the intersection of two of those line circled. Anyways, with much stoyline to this, which I am NOT typing out all of it's meanings. G8 Next Summit Location = ? Miguel's got a secret, and it hasto do with revealing his birthday. If you do this correctly, you'll get a fragment and a free Xi T-Shirt for our avatar. So go and enter his birthday in the Xi password hub. about the story or what so ever. USE "a keycard to the control room"
PICK UP "a large screwdriver"
PICK UP "an air canister"
PICK UP "a blank holodisc"
USE "the workstation power switch"
My advice is prety much folow the guidelines of the normal version. However, if you feel the helicopter is taking you into trees, break off on your own and find large spaces. There is something wrong with time in the Hexopolis area. Or is there? Find the hidden star. The clock faces have letters on them. unscramble them for the name of a star. Go to the newly opened manhole in Home Sq. to access the maintenance tunnels. In the locker room, open the locker at the back to view the photo of the man, this is what you need to change your avatar to in order to pass the security lasers. White parted hair, white eyebrows, white mustache, dark blue eyes and the green t-shirt. As far as I'm aware the pants/shoes don't matter. Once you're in you can register at the terminal to enable your avatar to pass without looking like the maintenance dude. The other terminal is password protected, the answers are TARANTINO, OBAMA, KOALA. It hints to some sort of Kanji. Maybe a region jump? Just remember to activate the quest first, before trying to add the colors into the terminal. Very easy, just put the colors in their rspective boxes for this. It's setup Blue, Yellow, Green. However, the color boxes are in the opposite directions. One space by one, move them to their listings and you get the fragment. The puzzle can be found at alphaafk, a sentimental journey. If you have looked at the puzzle you will recognize some of the abbreviation. Pretty much theres a lost note throughout all of Home. Your job is to find it by searching all the places, but i'l save you the trouble and just tell you everything. Over near the Listen @ Home booth, the right sign flashes. When it turns black, the yellow note can be shown saying "Et in Arcadia Ego." Put that answer in the holopad and you'll get your fragment. you need to find what color jess is hiding. In the new conversation she is trying to keep people out of maitenance. In said area there is a butterfly colored blue one the wall next to the lockers. Enter BLUE into the holopad. It will take you to your mail and there will be a new entry asking: "What color did Newton say lies between C and D?" The answer is Violet, enter into the holopad as well for the butterfly. In Alphazone 2 called "Light and Dark" there are 2 fish tanks. One is the Good tank and one is the Bad tank. Go to the good tank first and complete a set of mini games. These are really just for practice. After you finish the good tank go across the room to the bad tank. And use the skills from Tank 1 to complete tank 2. Turn the bottom lights on or off to ge an ODD or EVEN number. Very easy. You're on a timer though, so you have to be quick. You have 10 round to do it in and the timer carries over. There's a new butterfly, requiring to examine a video with letters going fast. You have to check your holomail to before activiting these puzzles. One is from Velicorp, a corperation that wants you to stop playing XI and join them. The other is from the Genesis Collective, in which our lovely Jess is from, and as given us access to XI in the first place. The story is setting up gamers to pick a side good vs evil, without giving all the story away. Once you pick a faction, head to the 2nd room. #3: Fireflies light up in a specific order and it's pretty much like the game simon. Just duplicate it. If you have a problem doing o, use a pen and pad for it, it'l go by quick. #4: They give you a puzzle you have to put back together, trick is they turn the lights out. You have a flash light, butyou can only use it a certain amount of times. It's not too hard, ut if you want to get through it fast with no thinking, I suggest using a digital camera to take a picture of the puzzle, before you it the button to scramble it. There's 3 to 4 puzzles in this set. #5: The easiest of the bunch. Pick the shadow in which the figure is standing. There's only 4 levels to this one, ut it's the easiest to get done. Fragment 14 is another picture puzzle on jess247.com called "Zoom" There are four photos with numbers hidden in them. Add all four numbers together and put them into the holopad. Walkthrough * Leave the Hub, and enter the Maintenance area via the manhole in Home Square/Central Plaza. * Head through to the security room, and access the terminals. * Switch round to terminal HM-S3, and activate the console. 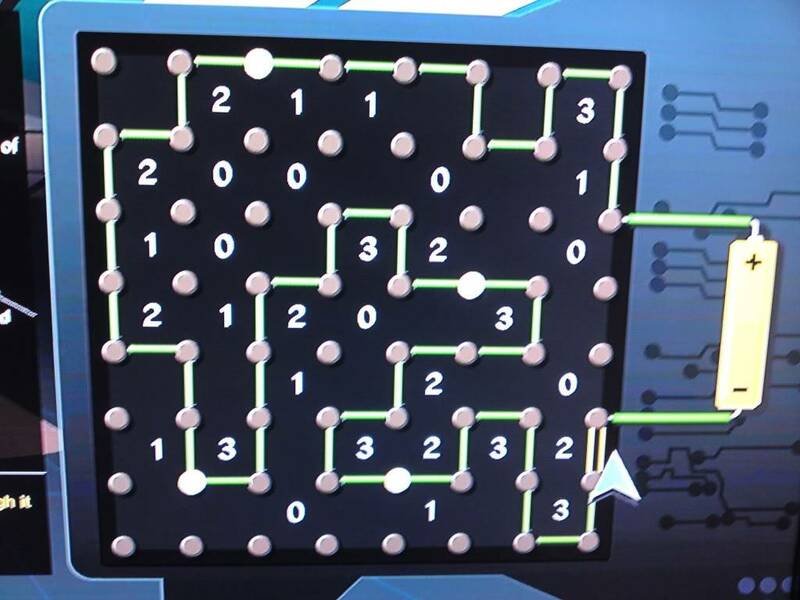 * You will be presented with a puzzle that requires you to join the input wire (bottom left) to all the output wires. * You will do this using six different types of pipe; four junctions and two straights. * Simply draw the least complicated map in your mind, and place the joints, then fill in the gaps with straights. 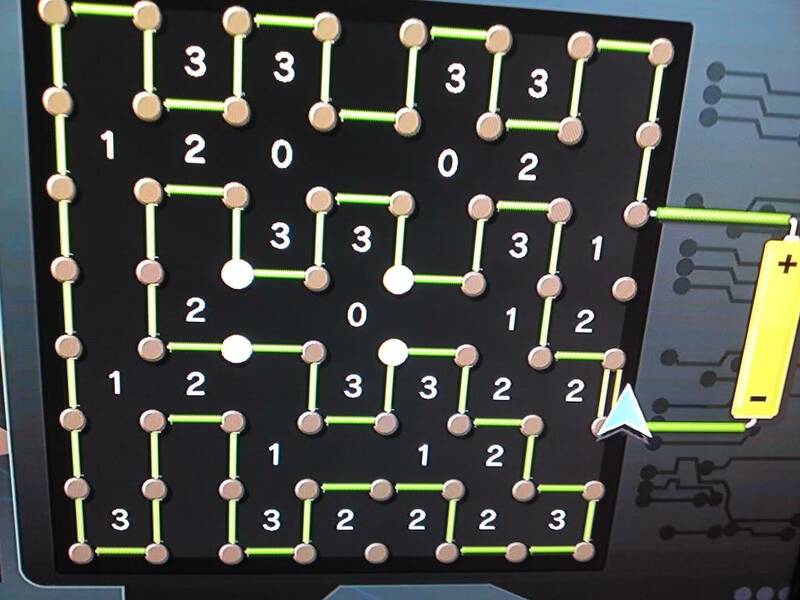 * If you're stuck, the solutions are as follows: Pending * Complete all three of these puzzles (all essentially the same, with the blocking boxes in different places). * Congratulations, fragment 15 is yours! Watch the music video in Jess's apartment, which is a night time summer house, with a boat sailing by you. Gather the beta testers names/initials. » July 9th Birthday Greetings!